Rust is a system programming language which runs blazingly fast, and prevents almost all crashes, segfaults, and data races. You might wonder exactly why yet another programming language is useful, since there are already so many of them. This article aims to explain why. You may have seen a diagram of the above spectrum. On one side there’s C/C++, which has more control of the hardware it’s running on. Therefore it lets the developer optimize performance by executing finer control over the generated machine code. However, this isn’t very safe; it’s easier to cause a segfault, or security bugs like Heartbleed. Somewhere in the middle, there’s Java and a few other languages which are a mixture of these characteristics. They offer some control of the hardware they run on but try to minimize vulnerabilities. 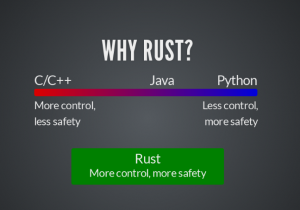 Rust is a bit different, and doesn’t fall in this spectrum. Instead it gives the developer both safety and control. Rust is a system programming language like C/C++, except that it gives the developer fine grained control over memory allocations. A garbage collector is not required. It has a minimal runtime, and runs very close to the bare metal. The developer has greater guarantees about the performance of the code. Furthermore, anyone who knows C/C++ can understand and write code for this language. Ownership. Each variable is moved to a new location, and prevents the previous location from using it. There is only one owner of each piece of data. Borrowing. Owned values can be borrowed to allow usage for a certain period of time. Drop us a mail at test@lists.fedoraproject.org or #fedora-qa on IRC Freenode to get started! It is good that Rust has good performance and making developers productive however Swift language is arguably better and more productive compared to Rust. Rust has good performance and it is a good alternative to c/c++, however Swift language is arguably better and more productive compared to Rust. Your compilation command has the wrong extension on the hello world program. @Paul: Thanks for catching this. Fixed now. C++ for certain tasks and Python for others… I’ve got to check out rust and see how it might unify my work. Thanks for sharing! It is an interesting language, and when used with cargo (which you need to install separately in F24), it seems quite usable. I’m checking out “The Book” right now. Thanks for letting us know. No such free lunch! What Rust excels at at the expense of readability. Languange trade-off always there. The same argument can be applied to any given programming language, trade off of human readability, safety of memory handling, crash potential, and control capability. I think Rust does have some place when considering greater control with the intent of stability, at the cost of readability maybe. Does that negate it’s place in the ecosystem though? I don’t think so. Perhaps we should return to the days when we did most cool things in machine code/mnemonics. I know that programming of computers, and other digital devices, tends to generate loyalty, usually proportional to time spent learning and becoming expert at it. For my part I apply much effort in trying to objectively look at languages as to their usability in any given area of application. Yet, I would lean towards the languages I am most comfortable and confident using, at least initially when considering a particular project for a customer. What’s the benefits of using Rust vs. Go? What’s the benefits of using Go vs. Rust ? That’s what I’d like to know! Well, every few years some new guys appear at the horizon and claim that their new programming language is the holy grail. And they mostly say that their language is fast. Perl did. Python did. Java did. Scala did. And now Rust. It seems that this could be true for Rust because there is only a small “runtime overhead”. And it is compiled! Yeah! But just take a look at the helloworld from above: A look at filesizes of comparable binaries created with C and ASM. Hello, Rust is running on Fedora 25 Alpha! Hello, C is running on Fedora 24! Hello, ASM is running on Fedora 24! Very interesting, thanks for sharing. Can I ask what are the differences between the ‘stripped’ and ‘non-stripped’ versions of the programs are? You see that “stripped” is a common term. Typically, stripped binaries remove any extraneous bits from the compiled binary – typically debugging symbols and such. non-stripped binaries include all debugging symbols plus a few extras. The issue of rust binary sizes is thoroughly explored in this excellent post: https://lifthrasiir.github.io/rustlog/why-is-a-rust-executable-large.html TL;DR if you want to remove jemalloc and libunwind, then your binaries can/will be comparable to C/C++. Neither Perl, nor Python have ever tried to be C/C++ in speed, although Java or ‘Scala’ have some impressive use cases, where it can beat C, so did they. Some people won’t eat anything they’ve never seen before.